Here’s the thing about Chavo Guerrero Jr — the guy’s unstoppable. With 12 major championships in a career spanning just as many years, he’s one of the most electrifying performers on the circuit. After his “retirement” from the ring he went on to dominate the first year of El Rey Network’s Lucha Underground, much to the excitement of his 500K social media followers and El Rey’s 10M-strong viewership. You could say Chavo’s stardom is matched only by his incredible family legacy, as he is the third generation of Guerrero family grappling. This heritage, charisma, and physicality is what Lion Forge tapped into when we teamed up with Chavo on his first comic book series, Chavo Guerrero’s Warrior’s Creed, launching this June. Written by comics hall-of-famer Fabian Nicieza (Deadpool, X-Men), the series pulls off a trick that’s challenged wrestling comics since the dawn of time: effectively combining true wrestling action with superheroics to make a dynamic series that manages to satisfy everyone. In Warrior’s Creed, Chavo’s retirement from the ring incites a series of escalating battles involving an ancient mystic cult that has plagued his family since the days of Gory Guerrero, Chavo’s legendary grandfather and Lucha Libre pioneer. 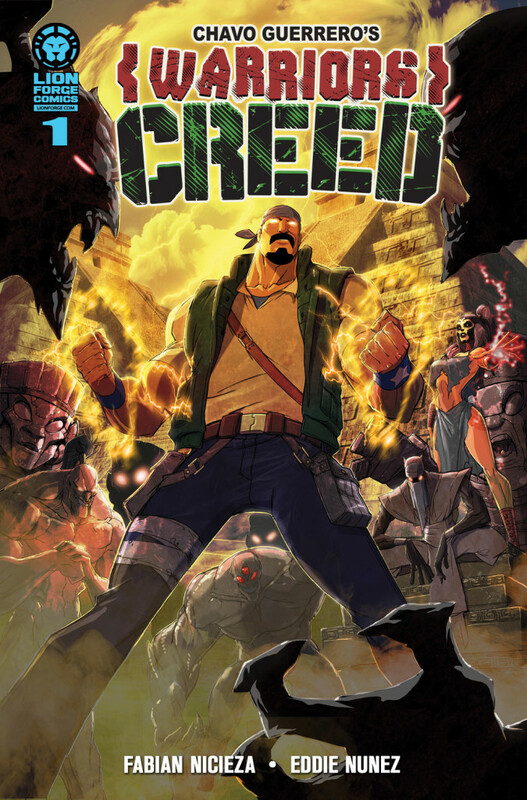 When Chavo discovers hidden superpowers and struggles to control them, Fabian deftly amps the superhero aspects with a high-stakes adventure into the Mexican jungle that never abandons the book’s wrestling core. Eddie Nunez (Teenage Mutant Ninja Turtles) and Fabiano Neves (Marvel Zombies/Army of Darkness, Vampirella) round out an all-Hispanic creative team with dynamic art that wants to burst off the page. It’s a fun read, priced to move, and works just as well for pro wrestling fans as it does for fans of polished, professional superhero action with no continuity baggage.